Plantar fasciitis is a painful inflammation of the strong line of connective tissue at the bottom of our feet, called the plantar aponeurosis or plantar fascia. Commonly experienced as intense heel pain when first standing in the morning, plantar fasciitis can progress to the point where it can significantly limit a person’s ability to move about their daily life. It’s quite common for people to find relief when wearing supportive shoes, orthotics, or heel lifts, as the external support restricts the motion of the foot to the point wheres the plantar fascia never moves enough to trigger that pain. This casting is a great strategy when dealing with an acute injury, but it does nothing to address the cause of the problem in the first place. Plantar fasciitis occurs when the tissue is stretched or strained past the point that it can handle. Training the foot to be better able to respond to a variety of textures and surfaces improves the suppleness of the plantar fascia, and thus can help you heal the painful inflammation on the bottom of your feet. The goal is to create longer tissue that is more supple and able to respond. Most plantar fasciitis treatments begin with stretching the calves, and this is my favorite way to do it. With the outside edges of your feet straight, place the ball of one foot on top of a half dome, rolled up yoga mat, or something similar. Take a step forward as you are able; you’ll feel a good stretch down the back of your calf. Hold for 30-60 seconds, repeat on the other side. Next, do this stretch again, but bend the knee of the elevated (stretching) foot. 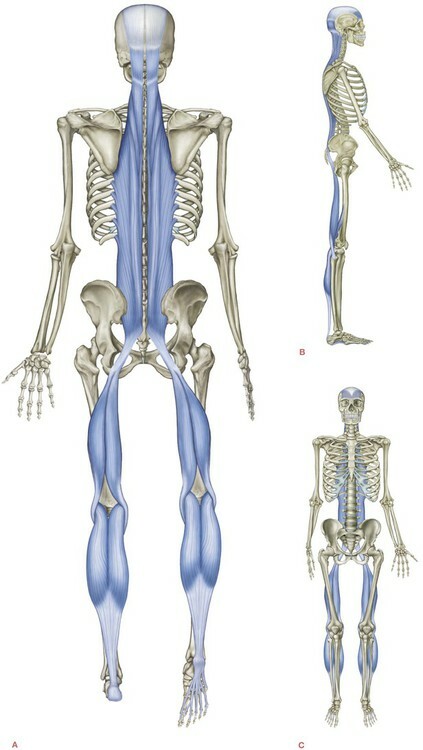 This moves the stretch from the gastrocnemius to the soleus and gets more into the achilles tendon and plantar fascia. Lie on your back with your thigh resting on the ground; if you need to bolster your shoulders to do this, go ahead. Place a yoga strap, belt, rope, or piece of woven fabric (I’ve had one client use a sarong) around the ball of your foot and use your arms to lift the leg. Make sure you’re pulling firmly on the strap so that your ankle is at 90 degrees; the goal is to improve the length along the back of the leg and the bottom of the foot. Don’t lift so high that your other thigh lifts off the ground. Did you know there’s a contiguous line of connective tissue from your feet to your head? This stretch is great for finding where your tightness and tension is, and stretching it out. Sitting on the ground place your feet against a wall or use the strap to hold them firmly. Drop your head to your chest and curl forward. You may feel a stretch anywhere along your back line. Play around with this frequently and note changes in sensation as you practice. Drape the ball of your foot over a tennis ball, rocks or something similar (I love Yoga TuneUp Balls for this). Press into the surface to create a stretch between any two joints of your foot and hold for a few seconds. Pick another spot, say 1/2″ over, and press again. Try to find 9-15 different spots on the bottom of your foot to slowly and carefully stretch over the ball. As great as massaging your foot with a ball can feel, that doesn’t create much change in the individual joint mobility as the tough plantar fascia can prevent the ball from getting int the joint. Working slowly and methodically will create that change. As sand shifts below your feet it creates a constantly changing shape. Different parts of your feet are both cradled and pressed against. Stiff joints are gently massaged and able to move. Your feet are made to work in a new way, but at the same time they are fully supported by shifting ground. This can feel amazing. Moreover, it can convince you both at the logical level, and at the neurological level, that more varied movement of the feet is safe and even beneficial. With care and support, moving areas frozen by pain can reduce the inflammation and create healing.